The importance of UVB lighting in lizard husbandry is well-established, but opinions differ regarding the specifics of delivering high-quality lighting to various lizard species. As the husbandry of chameleons is challenging compared with that of many other lizard species, it is especially important that you determine and provide the proper UVB lighting for them. In order to use their dietary calcium, chameleons must have adequate levels of the activated form of vitamin D, termed D3, in the blood stream. Lizards convert dietary vitamin D to D3 when they are exposed to light with wavelengths between 290 and 315 nanometers -- the UVB portion of the spectrum. In the wild, chameleons absorb UVB radiation from the sun; in captivity, UVB comes either from regular exposure to natural, unfiltered sunlight or from a commercially produced full-spectrum reptile bulb. Over 150 species of the family Chamaeleonidae can be found from Spain to India and south to Madagascar. Over this vast range, chameleons experience a variety of UVB levels, as sun exposure changes with latitude and with habitat. Additionally, the behavior of chameleons varies greatly, as some are forest floor dwellers like the stump-tailed chameleons (Brookesia sp.) and others, like veiled chameleons (Chamaeleo calyptratus) live, exposed, on branches atop dry plateaus. When determining the proper UVB lighting for your lizard, consider the creature's natural habitat and behavior. As lizards that live near the rainforest floor aren't exposed to high UVB levels, they should be provided with relatively low UVB levels in captivity. Provide species from higher UVB environments, like forest-edge habitats, with higher levels of UVB lighting. Many bulbs are rated for the percentage of overall radiation that is emitted in the UVB range. Low-UVB bulbs produce 1 percent to 2 percent UVB, moderate bulbs produce 4 percent or 5 percent UVB, and some high-UVB output bulbs produce 10 percent or more of their radiation in the UVB portion of the spectrum. It is important to read the packaging carefully, as many bulbs packaged as “full-spectrum” bulbs do not produce UVB light. Full-spectrum fluorescent tubes are a popular choice with hobbyists and are available in a variety of sizes, wattages and UVB concentrations. The drawback to fluorescent tubes is that they produce no heat; a separate basking light must be provided to provide warmth. Compact fluorescent bulbs have appeared in the marketplace, but independent testing is in early stages in regard to lizard husbandry. Mercury vapor bulbs reportedly produce high levels of UVB radiation. Mercury vapor bulbs differ from fluorescent bulbs in that they produce light and heat. The drawback to these bulbs is that they are more expensive than fluorescent bulbs and produce too much heat for some applications. In 2002, a study concentrating on UVB needs for female panther chameleons (Furcifer pardalis) was conducted by Gary W. Ferguson et al. and the results were published in “Zoo Biology." 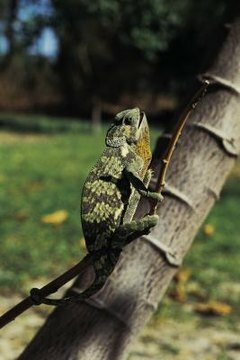 Ferguson and his colleagues raised and bred female panther chameleons with a variety of UVB sources, levels and exposure times. While the data set was small, consisting of only 28 individuals, the trends apparent are striking. Lights producing low to moderate levels of UVB are crucial to the reproductive success of the lizards. Extremely high UVB levels shortened the life spans and reproductive output of these lizards; those kept in extremely low UVB levels failed to reproduce at all. Males were not directly examined in the study, but the authors suggest they require lower UVB levels than females do. Further, shade-dwelling species like carpet chameleons (Furcifer lateralis) thrive with low UVB levels, as reported by the study’s author. The best strategy for a chameleon owner is to provide moderate UVB levels to species from sun-drenched habitats. For species that spend their time in the shade, low UVB levels are appropriate. Chameleons see and seek out UVB light, but it is unclear whether the behavior is self-limiting or not; some chameleons may expose themselves to too much UVB and develop health problems. For a captive habitat, lights should be on a screen top, rather than one made from glass or plastic, and the lizards should be able to crawl to within 12 inches of the light. The light should be left on for 10 to 14 hours daily, depending on the season and native habitat of the chameleon. UV Guide UK: What UV Light do Reptiles Need?